Displaying 251-255 of 276 result(s). The team were: Abarami Muthukumar, Aditya Jain, Aria Sharma, Ben Barton, Bobby Akeya-Price, Dennis Irvin, Edward Cross, Freddy Nunn, Isaac Willats, Kiran Shiatis, Mikey Watson, Navieinaah Girinath, Nikhil Chidipothu, Saahil Bansal, Thomas Gardner and Ximan Mao. Many thanks to GM Chris Ward, the Team Managers, Krishna Shiatis and Rachel Gardner, all the parents for their support on the day and of course to the children. Also big thanks to Hertfordshire for hosting a well organised event. U18: 1st Girinath Haridas (4.5 / 5), 2nd Rohan Bansal (3.5 / 5). There was an excellent showing from many schools, with a special mention to large contingents from Amherst in Sevenoaks and Dulwich Prep London. It was good to also welcome so many first time players.Some superb games of chess were played at all levels and this reflected on the excellent training being provided across Kent by our wonderful team of coaches and parents. Many thanks to Dulwich College for accommodating us and also a big thanks to the large number of parents who helped before and on the day. Our next Grand Prix will be held on Sunday 14th April at The Schools at Somerhill, Somerhill, Tonbridge, Kent, TN11 0NJ, another beautiful venue. This event doubles as the Secondary Schools Championship and starts at 9 am. This will be the sixth GP out of eight for the 2012/13 season. As usual you can enter on line and we hope to see many of you there once again. Also we wish our Kent teams the best of luck over the next few weeks. Well done to all the Kent juniors who took part in the Wiltshire and West of England Championship in Swindon on 16th and 17th of February 2013. Of particular note, Girinath Haridas won the Under 12 Championship with 5 points from 6 rounds, with Anantha Anilkumar joint second with 4.5 points. Anantha was joint winner of the U11 section. Robert Akeya-Price finished third in the U9 section and Jessica Wen was awarded the controllers prize for the best game in her section. 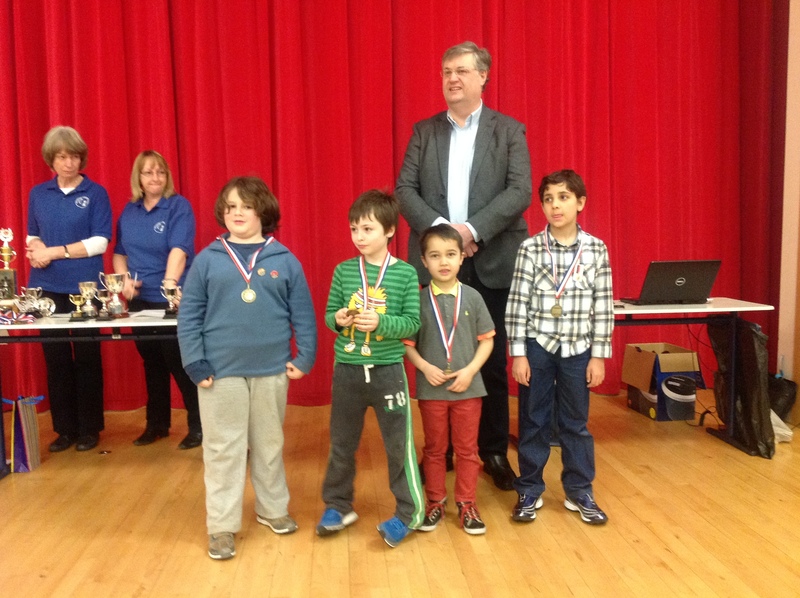 A big well done to all the children who sat the KJCA's Institute of Chess examination held at Barming Primary School on Sunday 3rd February 2013. <?xml:namespace prefix = o ns = "urn:schemas-microsoft-com:office:office" />The results are listed below and the certificates will be presented at the start of the KJCA Grand Prix tournament at Dulwich College on Sunday 3rd March 2013. This was the fourth GP of the season was held on Saturday 9th February 2013 at Gravesend Grammar School with 52 participants competing across four sections (with a combined U8 and U9 section and a combined U14 and U18 section). This event also doubles as the KJCA Primary Championship and medals were awarded to all attendees in the primary championship sections (U11 and below) as well as our prestigious permanent trophies. U18 / U14 combined: 1st equal Rohan Bansal and Anantha Anilkumar (4 / 5). As well as the more familiar schools, it was good to welcome a sizeable contingent of players from Anthony Roper Primary School, some playing in their first ever KJCA tournament. Many thanks to Gravesend Grammar for accomodating us and also a big thanks to all the parents who helped before and on the day. Our next Grand Prix will be held on Sunday 3rd March at Dulwich College, Dulwich Common, Dulwich, Kent, SE21 7LD starting at 9 am, which will be the fifth GP of the 2012/13 season. As usual you can enter on line or by sending an email to Sue Maguire at sue.maguire@btinternet.com.